Matty Kosylo says Town can reproduce their performance against Morecambe on a regular basis if they believe in themselves. The Shaymen were impressive in their 1-0 cup upset on Tuesday night, particularly during a dominant first-half in which Cameron King netted the decisive goal. 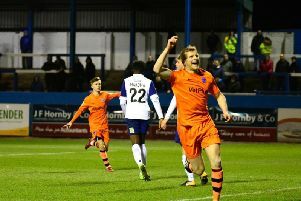 “I think we deserved it based on the first-half,” said Kosylo, who netted the winner in the 1-0 win against Dover last Saturday. “I think we were unlucky not to go in two-nil up at half-time. “But second-half, again, we had our backs to the wall a little bit, similar to Dover, but some of our defending was unbelievable. On both of Town’s last two games, Kosylo said: “I thought they were similar in terms of the two halves. “We dominated the first against Dover, we dominated the first on Tuesday against a league side, and were unlucky not to go in 2-0 at half-time. “We defended very well second-half, we limited them to long-range shots, and to be fair, the ones that were going on target, Clarkey, Browny, Jacob and Sellers were brilliant. Did the Dover win have an effect on the Town squad going into the Morecambe game? “Possibly. It gave us confidence because we were due the win, and, like I said weeks ago, we’d had good draws away at good teams,” Kosylo said. “It was just getting that 1-0 win and grinding something out. Kosylo says the ability is there in the Town squad to play like they did against Morecambe regularly. “When we get the opportunity to keep the ball now, we look a bit more confident,” he said. “We’ve got the players to pass it around, make triangles, keep it and cause problems. “With Cameron in the hole, myself, Jordan (Preston), Sanmi (Odelusi) played against Dover and played the first game against Morecambe, and we’ve got Mekhi (McLeod). “We’ve got good players, it’s just a case of believing and having that confidence. “Look at the start we had as well, and in the games we lost, we probably should have got a point or won, such as Salford and Boreham Wood. On Saturday’s trip to Ebbsfleet, where Town lost 2-0 last season, Kosylo said: “It’s brilliant to get two wins, but as boring as it sounds, it’s onto the next game now. Kosylo feels Town’s improved form of late has mirrored his own. “There were things going on in the background to do with work which probably stalled what I wanted to do in pre-season, but me and the gaffer have sorted everything out and I’ve been training full-time for a while,” he said. “It wasn’t the ideal start for me but I feel like I’m getting into my groove in the last two games, I feel more confident, I feel like I’m able to take more touches and play inside with Cameron.